The ADI team have returned from Strasbourg today shocked as MEPs vote to reduce significantly proposals from the European Commission to regulate animal experiments across Europe. Whilst some MEPs are presenting the amended Directive as a major step forward for animal protection, the reality is that several controls presented by the Commission were seriously weakened, and for most Member States it will be business as usual. Notably, a Commission proposal for all animal experiments to require prior authorisation was overturned. Instead MEPs backed measures that will require prior authorisation only for “moderate” and “severe” and experiments on primates. This leaves an estimated 4.3 million experiments on animals that will not require scrutiny before being authorised – thus approaching half of the experiments in the EU do not have to be examined to assess whether a non-animal method might be available. MEPs also delayed indefinitely a proposal by the Commission to phase out the capture of wild monkeys by breeding centres supplying European laboratories. The Commission had proposed that after seven years all monkeys supplied European laboratories would have to be born of captive bred primates. Tim Phillips, ADI Campaigns Director who was in Strasbourg for the vote commented: “There has been a sustained campaign of misinformation from bodies only interested in a supply of cheap monkey regardless of welfare cost. There is clear evidence of the horrific suffering of monkeys torn from the wild and also serious issues concerning depleting wild populations, and destabilising wild populations through the removal of large numbers of females." On the positive side, MEPs committed to increased funding of the development of replacements to animal experiments and expansion of the scope of the European Centre for the Validation of Alternative Methods. An ADI campaign since January for bi-annual thematic review of animal experiments bore fruit. ADI sought a mechanism to regularly review areas of research and set targets for the implementation of alternatives wherever possible. The proposals gained support as the Directive moved through Committee and gained the backing of the Parliament and Commission this week. MEPs voted for biannual thematic review specifically of primate experiments and also for all animal experiments. Stakeholders will be able to input the areas where the case for replacement is strongest. The review will be able to address implementation. For the first time in two decades, the Directive governing animal research and testing throughout the EU (known as Directive 86/609) is being revised. So, when the European Commission proposals were, in some instances, progressive it was hoped that MEPs would respect the will of the public and seek to strengthen this and take the measures further. It is accepted that the UK’s 23 year old Animals (Scientific Procedures) Act has put in place many regulatory mechanisms but has had very limited success ensuring the level of husbandry or restrictions on animal experimentation the public have been led to expect. It had been hoped that the EU Directive would raise the bar again, addressing the failings of the best European regulation. In the end MEPs voted for proposals which fall a long way short of what has been in place in the UK and several other member states for years. 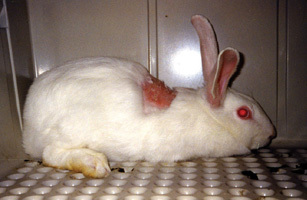 Indeed the campaign by the UK animal experimentation Community for such low standards across Europe is seen as a warning that there may now be an attempt to roll back UK laboratory animal protection. The ADI/NAVS ‘Vision for Europe’ report, giving a breakdown of the proposals and calls for amendments, is available here. The full text of Written Declaration 40 and details of MEP signatories supporting a timetable to phase out all primate tests is available here. The full text of the proposal to revise 86 609 EEC (released on November 5th, 2008) which governs the rules on all animal testing across Europe is available here.